Another pretty quiet week on the movie watching front - once again, I've been distracted by my current favourite TV show, Breaking Bad. Sadly for me, I've now finished Season 4, and will have to wait a long time before I can continue the story of Walter White's seemingly endless downward spiral. Season 5 hasn't even started in the US yet, so I doubt we'll be seeing the DVDs in Europe until at least 2013. I'll just have to content myself with rewatching the first couple of seasons of the show - a happier time, when Walter and Jesse were just a pair of mismatched meth cooks, rather than the coldblooded sociopaths they have become in the most recent series. This week was also only the second week thus far this year in which I've failed to make a trip to the cinema. I aim to rectify that situation next week, as I'm planning to see two very different films. On the lighter side of things, the new Aardman picture "The Pirates! In an Adventure with Scientists!" is now out on general release, so I'm planning to check that one out on Wednesday. Any joy or merriment I experience from seeing that film will be short lived, however - I'm also intending to see Werner Herzog's sobering documentary about the death penalty (Into The Abyss) next weekend. 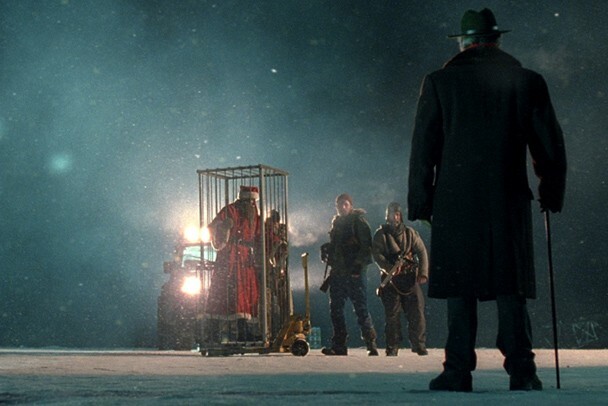 A very unusual film, this one - set in Lapland, it's an alternative look at the story of Santa Claus. The premise here is that Father Christmas is real, and has been awoken from a centuries-long slumber by a careless group of engineers. Now, I thought Billy Bob Thornton was a bad role model in Bad Santa, but compared to the version of Saint Nick we see in this movie, he's a veritable saint. As one Finnish youngster discovers, the real Santa takes punishing naughty children far more seriously than dishing out presents to kids who've been good. Not only that, but he has an army of elderly, bearded elves who are determined to defrost their fiendish master and see him rule Christmastime once more. Only a small band of Finnish villagers stands in their way... Although it may have been more appropriate to see Rare Exports in the festive period in December, I still enjoyed this movie. It's unlike anything I've seen before, and provides a winning combination of dark humour, action and scares. Considering the film's low budget (1.8 million Euros), the CGI effects used here are really quite effective. My only grumble would be that some of the cast members aren't the greatest actors in the world, though weighed against this movie's merits, it's not really a big problem. I just feel sorry for the poor old guys who played the elves - standing around naked in the middle of winter in Finland can't have been too much fun. Anyway, if you only see one Finnish evil Santa Claus film this year, make sure it's this one. It must have been a bit tricky to pitch the concept for this movie to studio executives - I can't imagine that a comedy about cancer would have been an easy sell. Nevertheless, director Jonathan Levine does pull it off, more or less, handling the subject matter with sensitivity, whilst getting quite a few laughs. Our protagonist here is Adam Lerner (Joseph Gordon-Levitt), a level-headed young guy who works for a Seattle radio station, along with his brash, outgoing best friend Kyle (Seth Rogen). Everything in Adam's life is turned upside down when he discovers that he's been diagnosed with a rare form of spinal cancer - one which gives him a 50/50 chance of survival. As I mentioned above, this movie generally works pretty well, with a decent script and some strong, believable central characters. The always dependable Joseph Gordon-Levitt is very good in the central role - portraying a character who is flawed but still largely sympathetic. He's admirably backed up Anna Kendrick, who plays Adam's therapist/ potential love interest, and is sweet and funny. I was less sold on Seth Rogen's character, however. Though he does come out with a number of the film's funniest lines, at times his actions border on the cruel and obnoxious, particularly in the way he treats Adam's (admittedly selfish) girlfriend. If I was to be ultra critical, I did feel that while the film doesn't exactly gloss over the horrors of cancer, it's hardly an unflinching look into the dark side of Adam's condition. I suppose that taking a raw and unsanitised look into mortality and sickness would pretty much negate the possibility of finding any humour in the situation. 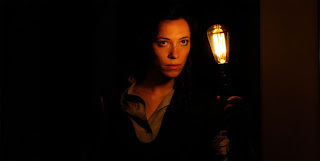 A period ghost story in a similar vein to the recent Daniel Radcliffe picture The Woman in Black, this time we have a story set just after the First World War, with Rebecca Hall sent up North to a spooky old house in the bleak Cumbrian countryside. Hall plays Florence Cathcart, an educated woman and professional debunker of spiritualists, mystics and psychics. She is asked by a teacher played by Dominic West (aka McNulty in The Wire) to investigate a boy's boarding school which is rumoured to be haunted by the ghost of a former resident. As a believer in rationality and science, Florence is determined to prove that there is a rational explanation for the sightings of the spirit, but on arrival at the school, it is soon apparent that she may be in over her head... Now this is a film which I largely enjoyed for the first hour or so - setting a ghost story shortly after the First World War is a fine idea, and the movie explores some interesting territory in examining a time and place where almost every character has suffered pain and trauma - either directly through fighting in the trenches, or indirectly through losing a loved one. The film is well shot and handsomely appointed and Hall, West and Imelda Staunton (as the creepy matron of the school) are all very good in their respective roles. Unfortunately for me, the movie is completely let down by a frustratingly implausible and ridiculous ending. I usually try not to give away any spoilers to the endings of films on this blog, but in this case, I feel that I'll have to make an exception to explain myself. (*Massive spoilers ahead*). The big twist here is that Florence is the half-sister of the ghostly boy at the school - who was murdered when her father ran amok with a shotgun some twenty years previously. The school had been set up at the site of her former home, and Florence had been lured there by the school matron (who was the boy's mother and Florence's former nanny); the reason why Florence has been unable to recognise her brother, nanny and former home is apparently because the trauma of the incident lead to her 'blacking out' all memory of it. Now, I could maybe buy all that (though it does seriously stretch the bounds of plausibility), but we are also told that Florence was adopted after the incident, and indeed, she is living with those adopted parents in the opening scene in London, where they are privy to the conversation with Dominic West's character. Surely, having kept the tragedy a secret for twenty years and having seen the name and location of the school, her adopted parents would have said something to Florence to prevent her from heading up there? This twist ending is so absurd that, for me, it ruins all of the good work up to the point of the big reveal. It's a real shame - with a less gimmicky ending, the film could have been a success. This is one of those cult '80s movies which I missed the first time around, but have now finally had a chance to catch up with. The plotline sees a group of kids take a stand against a gang of teenage vampires who are causing trouble in a small seaside town in California. Starring in the movie we have a number of actors who were big names at the time: Kiefer Sutherland plays David, the leader of the vampires, Alex Winter (aka Bill S. Preston, Esq.) is one of his acolytes, Coreys Feldman and Haim play two of the kids who take on the vampires, and Jason Patric is Haim's older brother, a troubled teenager who is lured into the clutches of the gang by a beautiful young woman (Jami Gertz). It's directed by Joel Schumacher, so, as expected, it's highly colourful and stylish, albeit in a way that looks pretty dated nowadays. 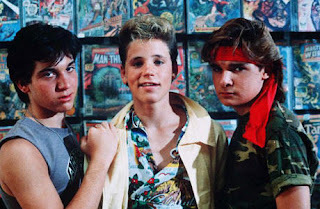 All in all, the Lost Boys is fun to watch as a sort of flashback to the wacky days of the '80s, and there are some truly awesome(ly bad) haircuts and outfits on display here. I have to admit that I loved one scene in particular: one of the vamps is dissolved in a bath tub full of garlic and holy water, leading to vampire blood exploding out of every tap, sink and plughole in the house (yes, I'm easily amused). Still, I'm not entirely sure that the film's as great as its many fans seem to think. I suppose it makes a big difference whether you initially see it as a kid - I'm prepared to cut movies like The Goonies and Flight of the Navigator a lot of slack, mainly based on warm recollections of watching them on VHS in the late '80s. I didn't have that kind of nostalgic emotional connection with this one, so I suppose it's inevitable that I can't rate it as highly.